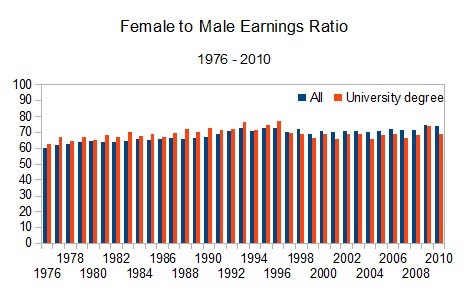 BREAKING NEWS: Women are paid less than men across OECD (read: rich) countries. This is not unique to Canada. Â The OECD has launched a new campaign, Closing the Gender Gap: Act Now. Â They suggest that governments looking for a way out of the current economic crisis should focus on improving gender equality.Â They point to the fact that investment in gender equality has the best return of any economic development strategy. So what about Canada, where women are now the majority on many university campuses, and face no formal barriers to inclusion in decision making institutions? We can encourage women to pursue non-traditional and higher paying occupations, and we can support women in seeking elected office at all levels. Â Companies can make an effort to appoint some women to their boards. But until the structural issue of affordable childcare (what I think of as the Giant Elephant in the Gender Wage Gap debate) is addressed, those efforts will have only marginal impacts. Even though the labour force participation of Canadian mothers is higher than the OECD average, Canadaâ€™s spending on child care, at 0.25% of GDP, falls far behind that of other OECD countries.Â The Canadian country paperÂ on Closing the Gender Gap notes that the gender pay gap in Canada is particularly large for women 25-44 with at least one child at home, and that far more Canadian women than men work part-time. There is a very effective public policy solution. Quebecâ€™s universal child care program was introduced at the same time as very effective pay equity legislation, which has resulted in higher labour force participation for Quebec mothers, and a reduction of the gender wage gap for Quebec women aged 25-44. Public investment in early childhood education and care has long-term productivity benefits as well as short-term economic stimulus benefits. It is a policy that has been shown that it can pay for itself with high returns on the initial investment. Â And it can help close the stubborn wage gap that women face – all of which helps long term economic prospects for Canada. Thanks Angela for keeping these issues alive for us. There is considerable variation in public policy on wages across the country and what has happened in BC during the past 10 years has been particularly hard on women. Women’s earnings in BC are now considerably below the national the national average. Part of the responsibility for this lies in the very low-wage policy adopted by the government, including having a static minimum wage for over 10 years, and considerable reductions in labour protections. All of these changes impact women, because they predominate among low-wage workers.